Stanley Park is Vancouver’s number one tourist attraction. It’s easy to see why, especially in the summer. There are so many things to do in Stanley Park that one could easily spend several days here exploring all the options. 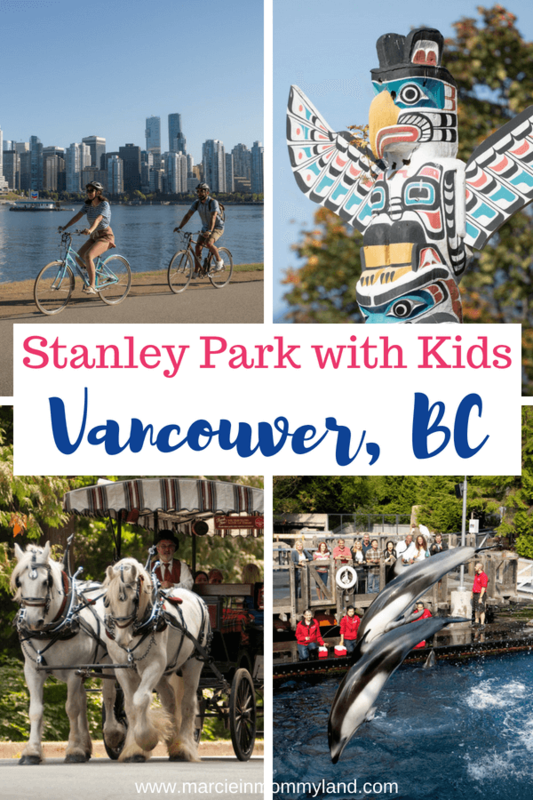 A few of the activities include: Stanley Park train, the Tea House at Stanley Park, Stanley Park Horse Drawn Tour, Stanley Park bike rentals, and so much more. The views are beautiful and the park is expansive. I had always seen the horse drawn carriage rides when we have driven through Stanley Park in the past, but we never looked into it. This time, I decided it would be the perfect way to start our day in Stanley Park. My toddler was especially excited since he had his first pony ride just days earlier. He couldn’t believe how big our horses, Andy and Jay, were! We sat right behind the driver and as soon as the carriage filled up, we slowly trotted on our journey. At first I thought the ride was a bit bumpy, but after a few minutes, I didn’t notice it at all. Our tour guide had a lovely presentation of facts mixed with stories about the people and places of Stanley Park. We had five minutes to get off and look around the Totem Poles and the waterfront, but the rest of the time was spent in the carriage. We really enjoyed the breathtaking scenery! If you sit in the front row, right behind the driver, you may have reins at your feet. They aren’t long, but could be uncomfortable if you have long legs. There are just ropes on the sides of the carriage, so keep an eye on small kiddos who may be sitting close to the edge. Be warned, you will pass an awesome spray park and your kiddos may want to stop and play. You can’t hop off the tour, so you can go back after the Stanely Park Horse Drawn Carriage Ride. The spray park has a Kid Dryer, where you can dry off your kids if you didn’t bring a towel. That sounds like an experience in itself! Every year, we come to Vancouver for my son’s birthday, which falls right after Christmas. Every year, I suggest that we do the Stanley Park train, but it never works out with our plans. So, we made it a priority to do it this trip. My toddler is a big fan of trains and he loved every minute of this! I assumed that it would be similar to the Horse Drawn tour where we’d go around the park. It never occurred to me why I’d never seen the train in action before. It’s tucked away in the woods! The conductor drives a miniature version of a steam locomotive and you meander through the woods checking out sights like Big Foot, Charlie Brown, Foghorn Leghorn, Kermit the Frog and more! Besides spotting the characters, the journey is actually pretty stunning as the train roams the forest of giant trees, through a tunnel, crosses a tiny brook and around a beautiful pond. It’s about a 12 minute ride and it feels like the right length. It was so fun that we will definitely come back, especially for their Stanely Park Christmas Train. The front of the train, right behind the conductor, seems to be the most coveted spot. Get there early if your kiddo wants to sit there. Your train-enthusiast child may want to do the ride several times. There is a concession stand nearby that has lunch items and mini donuts. If your child is celebrating a birthday, you can reserve the train for a private birthday celebration! We opted for a quick lunch at the nearby concession stand so we could head back to our hotel for a quick nap. 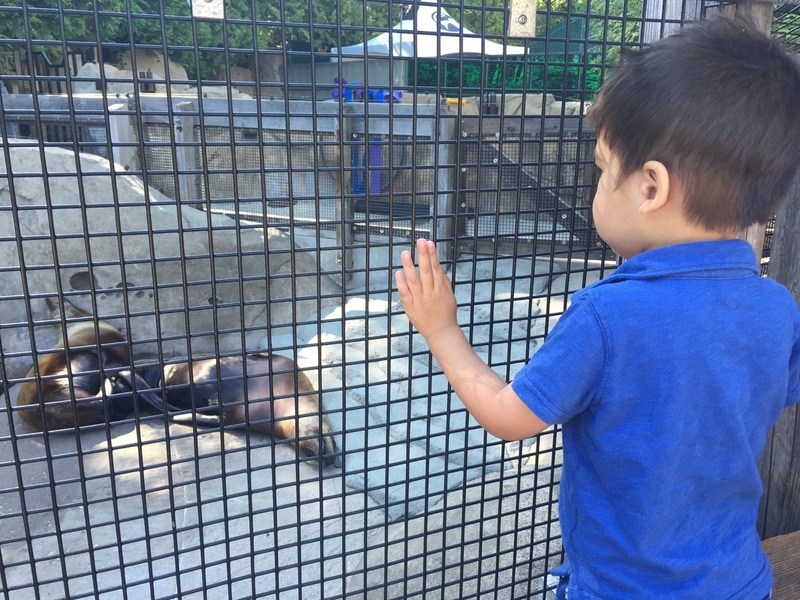 My toddler decided he didn’t want to nap (he told me he was too excited for the bus ride), so after resting a bit, we got on the Hop-on-Hop Off Bus to explore the city and stop at the Vancouver Aquarium. If you are headed to the Vancouver Aquarium, Waterfall Cafe might be a great place to stop for lunch. It’s located just a few minutes from the Stanley Park info booth. Their sunny patio is a nice place to enjoy a bite and take in views of the Vancouver Aquarium, the 300 year old Western Red Cedar tree, and Bill’s Reid’s Chief of the Undersea World sculpture. The Waterfall Cafe is open from June to September, and admission to the Aquarium is not required. If you want to enjoy a leisurely meal, check out the Tea House at Stanley Park. They offer seafood dishes, steak, pizza, brunch and many other kid-friendly menu options. It’s a higher end restaurant and the view of Stanley Park is incredible! The Hop On Hop Off bus ride was a lot of fun! I loved the open air top because I could really experience the city. My toddler had a blast for the first 30 minutes and then he fell asleep…hard. It was a bit difficult to hear the narration and announcements, but it was such a relaxing way to see the city. I love bus tours and would definitely do this one again. The only downside was when we were dropped off at the Vancouver Aquarium, we didn’t know that the last bus was an hour and a half later. Had we known, we would have planned accordingly. I wish they would have handed us a brochure with the times on it. We ended up (fortunately) hailing a taxi after we realized the last bus came before the Aquarium even closed. Get a map. I cannot stress this enough. Pick just a few places to stop if you use it all day. The line to get on the bus at popular places like Granville Island was incredibly long and you may have to wait. 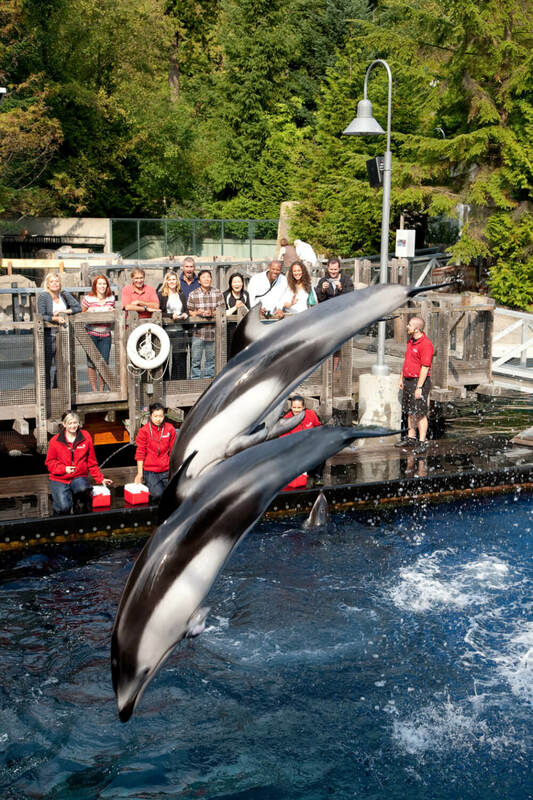 Vancouver Aquarium is the largest aquarium in Canada and it was recently expanded. I had been before several years ago in December and remember it was cool, but nothing specific. By the time we arrived to the Aquarium, my toddler was pretty worn out and didn’t really want to explore too much. I gave him a quick snack and we did a speedy walk thru of the Tropical Fish and Amazon area. My son really wanted to head outside, so we headed out. This was my favorite part! We don’t have big mammals at our Seattle Aquarium, so it was a real treat to see the belugas and the dolphin! I wanted to explore more, but my toddler saw the ice cream stand and didn’t want to do anything else. He had a huge tantrum when we tried to look at the belugas and we ended up spending the rest of our time at the Aquarium eating a quick dinner and getting ice cream. Next time, we’ll try to do the Vancouver Aquarium in the morning when moods are better. Get off the beaten path of Stanley Park and find out the tragic history of Deadman’s Island, discover the location of a long lost indigenous village known as Whoi Whoi, see trees that are hundreds of years old and more! This 90-minute walking tour is led by a First Nations descendant and cultural ambassador. 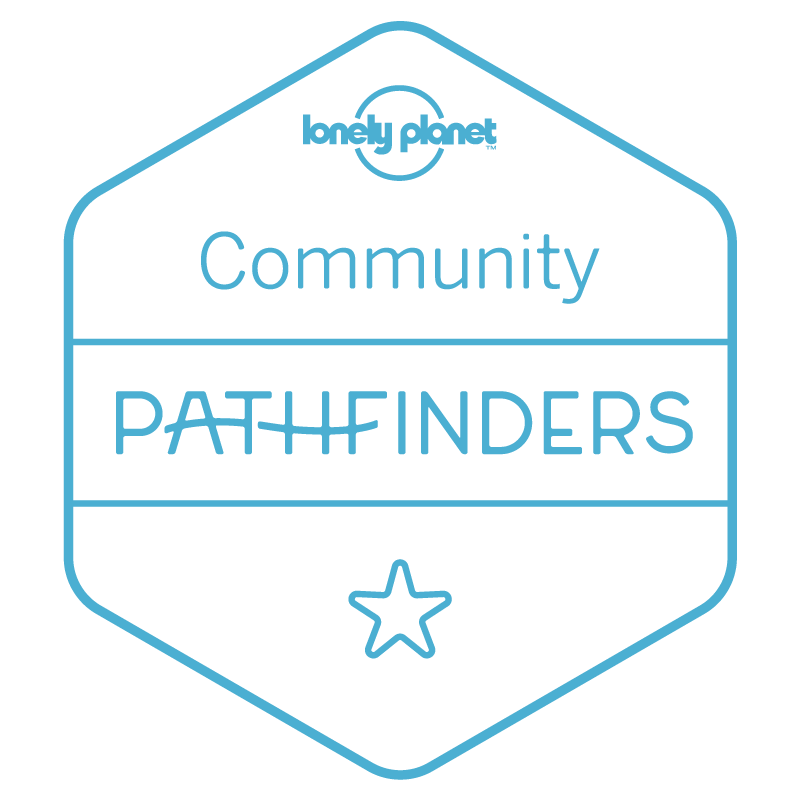 See how the tour aboriginal people lived and managed the land, the forest and oceans for countless generations. It’s just over a mile long and is a great educational activity for families. Something that we didn’t do this trip, but would love to do next time we’re in Vancouver in the summer is to rent a bike in Stanley Park. I’ve found a couple of companies that offer services to families with young children. And you can always do a private bike tour. 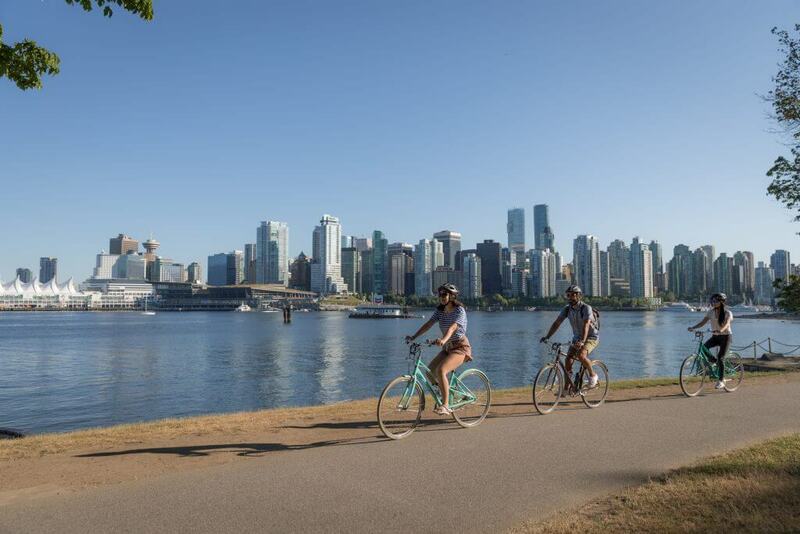 Conveniently located at the entrance of Stanley Park, Spokes Bicycle Rentals has been serving Vancouver locals and tourists since 1938. They have the largest selection of the newest bicycles and offer complimentary helmets and locks. Plus, they have balance bikes, children’s 1 speed bikes, trail-a-bike, child trailer, and child’s seats for adult bicycles. Another option is English Bay Bike Rentals, which offers kids’ bikes, child trailers, child seats, and junior mountain bikes. 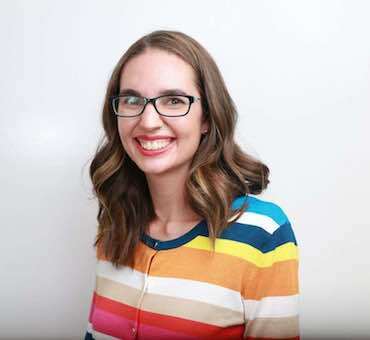 They have 12″ and 16″ kids bikes that are available with or without training wheels. And they have the Weehoo tag along bike that attaches to their Hybrid or Crosstail bikes and gives kids the ability to pedal along and enjoy riding while an adult does the work! You can also book a private family tour if you’d like a guided tour around Vancouver with kids. 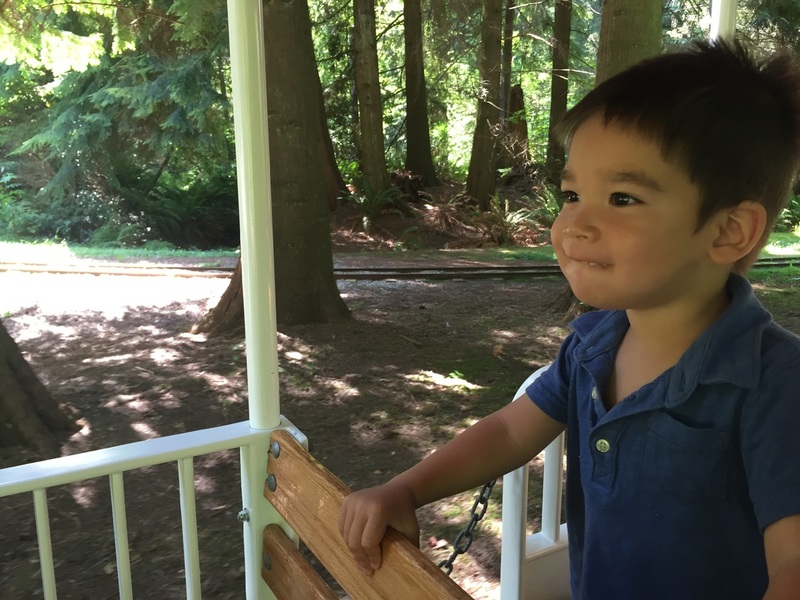 If your kids just want to run around, check out some of the Stanley Park playgrounds! There are four designated children’s playgrounds located near other Stanley Park attractions and activities. Plus, the park itself is one big Vancouver playground! What better way to watch a movie than to experience an outdoor movie at Stanley Park? During July and August (weather permitting) families can watch movies every Tuesday night after sunset. It’s free to sit on the Grand Lawn and Ceperley Meadow. Just show up with your picnic blanket or lawn chair to enjoy this Stanley Park summer evening tradition! Update: We did the Stanley Park Christmas Train last year and it was fantastic! You can read about it here. Ride the Bright Nights Train and experience the lights, breathtaking displays, and live performers along the train route. But, Bright Nights at Stanley Park is so much more than just a train ride. You can also view the displays at the Train Plaza by donation ($5.00 suggested). Wondering where to park at Stanley Park? There are a ton of pay parking lots. They have passes sold by the hour, day, season or year. If you are visiting from out of town, I recommend getting a day pass. Since Stanley Park is so massive, it’s easier to drive and park rather than walk, especially with kids. 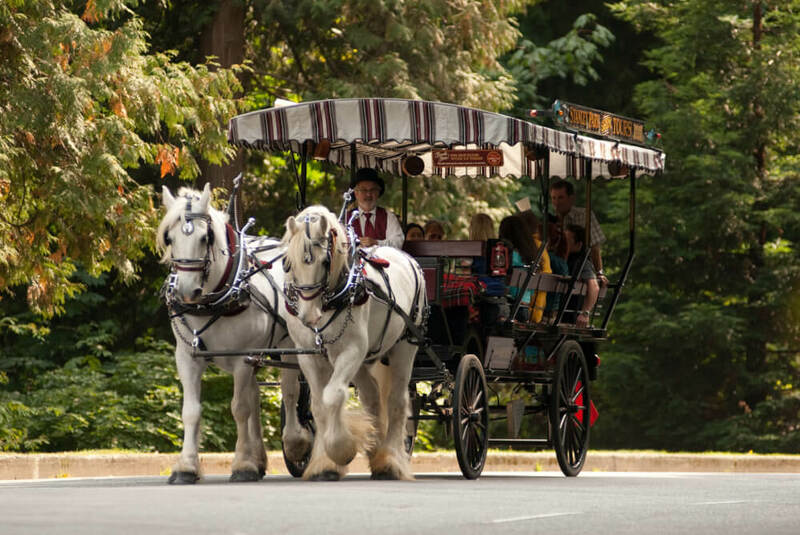 Tourism Vancouver provided admission to Stanley Park Horse Drawn Carriage, Hop On Hop Off Bus and the Vancouver Aquarium for review purposes. Looking for more things to do in Vancouver, BC? That sounds like a really nice place to spend time with the family. I have never been to Vancouver, but would like to go someday. It looks like y’all had so much fun! I love experiencing things with my kids because it is so much fun seeing them learn and seeing how excited they get. This looks like a lot of fun!! It’s good tips to know when traveling certain places with a little one. I’d love to go here someday with the family. It looks like you had a lot of fun! 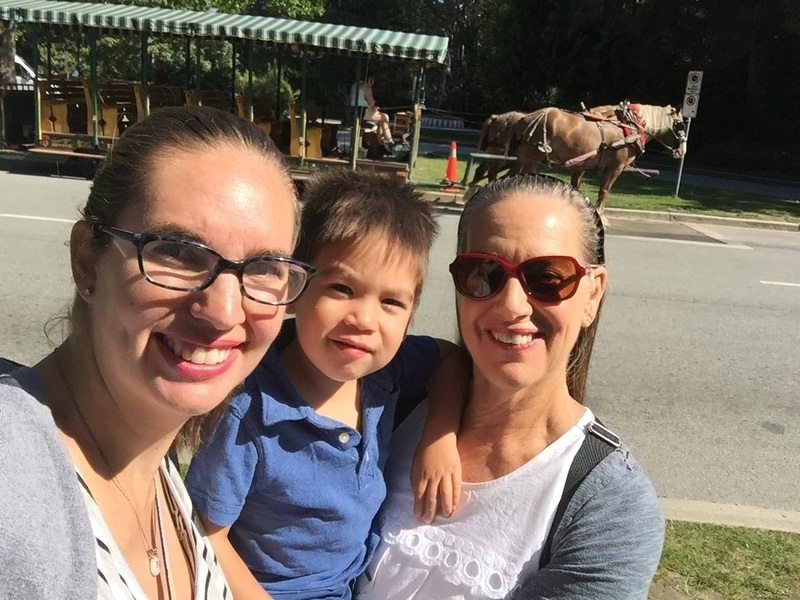 I love that you have given all the best tips here for other parents seeing the sights in Vancouver! 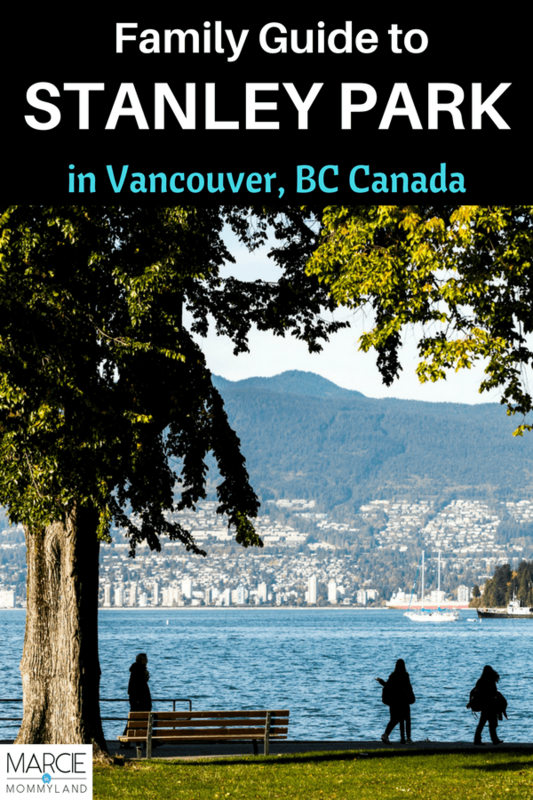 Vancouver is one of my favorite summertime destinations! Hoping to help other parents navigate it! haha – laughing at your “get a map” because its SO true! Even without a toddler! Oh, and what joy and curiosity in his face on the horse drawn carriage! Glad to make you chuckle! Definitely a good move! Looks like you made some awesome memories there! What great photos and those smiles are priceless! Thanks! I’m hoping to head back with my 7-month-old baby this summer! Looks like the little guy had a great time in Stanley Park. That is so cool he has been traveling to so many places, seeing the world! Looks like there are a lot of great things to do with a toddler in Vancouver. Going on a train ride or carriage ride is such a smart idea. You can see the area while also keeping your little one entertained. Wow! such a quality time with family! I am sure it was a fun outing! What a lovely park to go to! I love that it’s perfect for taking your kids to. There’s definitely lots to look forward to here. I’m glad you had a lot of fun. Stanley Park is a must-do stop in Vancouver! It would be nice to go here this season when the weather is nice and the sun is up! I’m sure it’s going to lots of fun especially when you’re with the family. Yes, May-September in Vancouver really can’t be beat! Looks like quite the place to explore. I’ve heard a lot about Stanley Park but I myself haven’t ever been to Vancouver. I would love to visit! Vancouver is awesome year-round but I especially enjoy it during May-September! Vancouver is one of those places that I have often wondered about. I have always wanted to visit a place in the Pacific Northwest and this is one of them. I think it would be a wonderful place to visit. If you do head to the PNW, let me know! Vancouver, Seattle and Portland are must-see cities, in my book! Stanley Park looks like a fun place to visit with your children. Your adorable son looks like he had a great time! It’s nature’s playground! 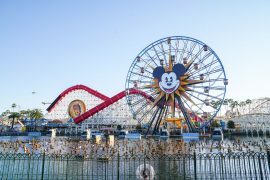 Plus they have so many cool attractions there! Please go! Even if you just drive through it! Oh how fun! I love seeing pics of happy little kids out exploring and having a good time. It’s so important to introduce your child to all sorts of new things and you guys are doing such a wonderful job of that. Love this post! Thanks! We love our outdoor adventures! This seems like a really lovely family day out and seemed to work well for your family. 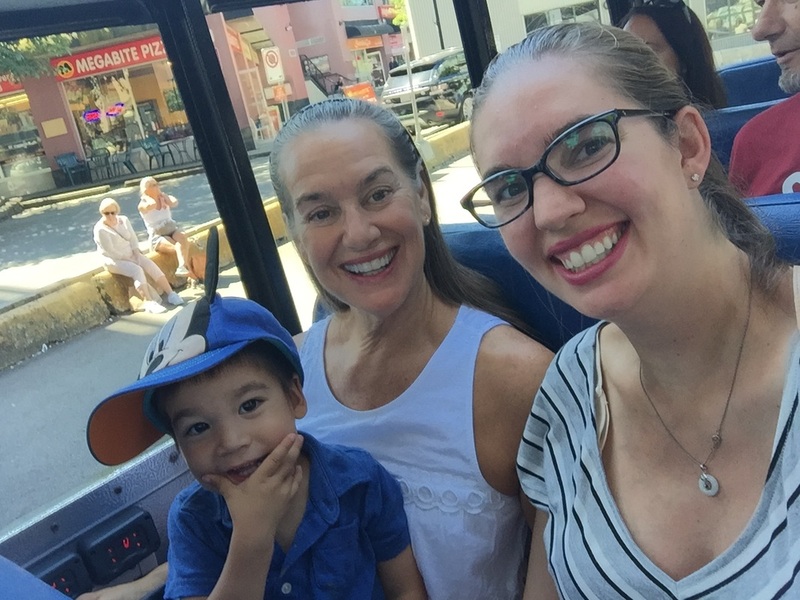 You’ve provided some really helpful tips for others travelling to Vancouver with little ones. I would love to go visit one day. The last time we were in Vancouver I was pregnant with my now eight year old daughter. We would love to go back and bring both our daughters for a family weekend. The aquarium looks beautiful and my oldest daughter loves sea lions! This looks like such a fun place to explore. I would love to be able to bring my kids here and play. I am heading to Vancouver in February so it was fab to see all the different options here. I wonder if they do Park Run there as I would love to go running the park. It certainly seems big enough! Oh you’re going to have a great trip! I’m not sure when their organized running events are, but I always see folks running near the Seawall. Definitely stop by the Olympic Cauldron if you run around the Waterfront! Wow! 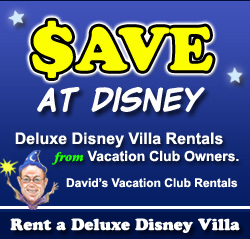 That looks like such a great vacation destination. I love all the outdoor activities and that light tunnel is amazing! 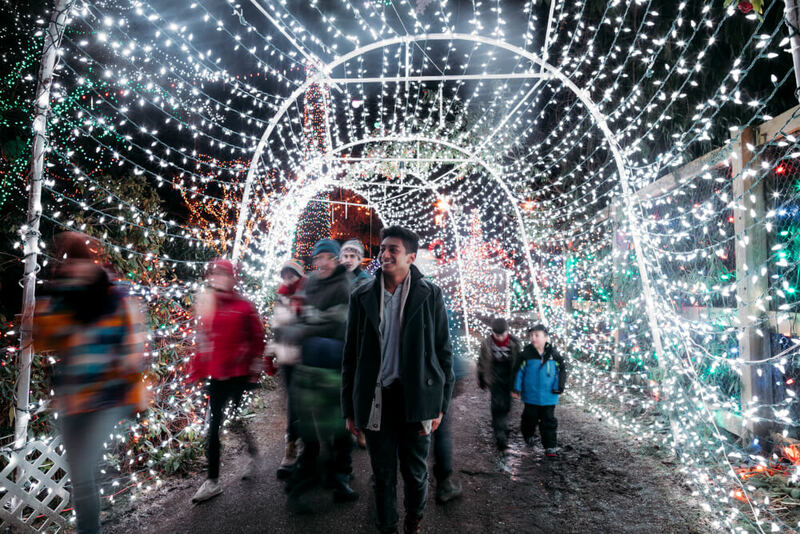 Yes, Bright Nights at Stanley Park is a fun holiday event! Stanley Park looks so beautiful! I’ll have to make sure I add this to my travel list when I finally make it to Vancouver! Vancouver is DEFINITELY worth a place on your bucket list! Renting bikes and going to the aquarium are my favorite things to do at Stanley park (other than walking around the seawall, but that’s quite the task with a toddler I’d imagine, haha). YES! It was just too much walking for his little legs and my pregnant belly! LOVED the pictures! Great information! Thank you! Thanks! It’s such a cool park to explore in British Columbia! Vancouver looks like such a fun place to visit! Thanks for sharing these awesome tips! Wow! There is so much to do there, and it’s such a beautiful place! Great post! Yes, it’s an awesome way to spend a day in Vancouver with kids! This would be a fun place to check out. The spray park would be my boys favorite place. Yes, we’re excited to bring the boys back in the summer so we can take advantage of that spray park! Oohh, I love aquarium trips! That looks so fun! This is such a nice aquarium! Stanley Park looks like it has something for everyone. I love the sound of the horse-drawn carriage, I remember riding a similar one in Sevilla. There’s also something I enjoy about having lunch in a tea house in a park; maybe it’s the though of al fresco dining! A lovely place, and one I’d like to see one day. Go during the warmer months to take full advantage of the al fresco experience! Wow! There looks like there really is something for everyone at Stanley park! I would love to try some of these things. I am sure it would be so much fun for a toddler! We all had a blast at Stanley Park! There’s so much fun stuff to do here, the horse ride, in particular, would be a must-do for me! Yes, the horse ride was such a nice pace! I’ve never been to Vancouver before. Looks like a beautiful place that i will have to go to someday! It’s similar to Seattle with hints of Europe. It’s a very cool city! I hope to visit one day! We are going to RV live until we don’t want to anymore and travel the country. If we can make it up there, we will take the whole family! Oh what a fun adventure! Yes, try to get up to BC to explore Vancouver, Squamish and Whistler! Yes, Vancouver has a lot of treasures, especially at Stanley Park! This would be such a fun place to visit. There is so much to see and do here. I was so impressed with all the activities at Stanley Park! This looks really fun and I am sharing this post with my best friend. They just moved to Vancouver and I believe her daughter would love to this place. Thank you for sharing all of these tips. Very helpful. Yay! Glad to help! It’s such a kid-friendly city! Wow, this looks like a cool park for families. I love that they have light shows. I’d be all about that. Also renting bikes looks like such a fun thing to do! I really want to do an outdoor movie there in the summer! Wow, this looks like so much fun! And you did it with a little one too, so that’s super encouraging! 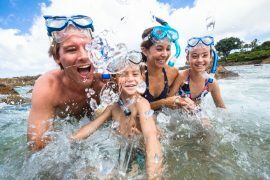 Yes, it’s such a doable day trip with kids! Thanks so much for your kind words! It’s a very well-designed park! 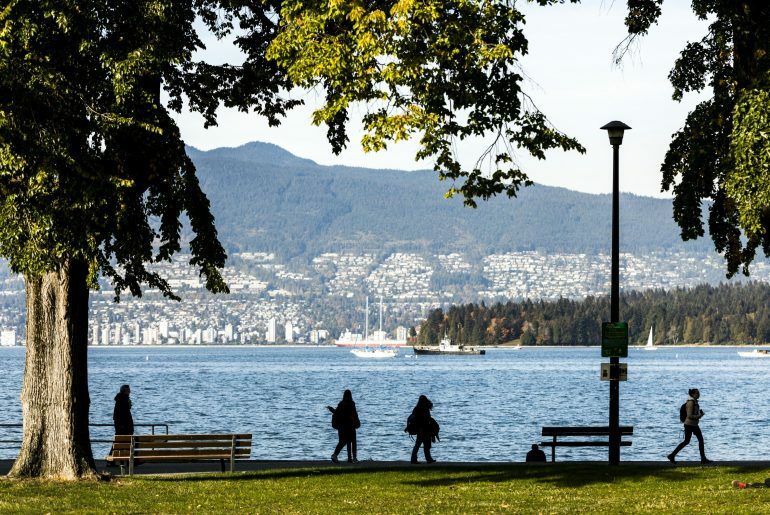 Stanley Park looks like a great place to spend the day – with or without a kid! I absolutely love the idea of the carriage ride, it looks like a leisurely but also interesting way to tour the park and of course I’d have to enjoy some time in the tea house! Lovely! Yes, it’s like their version of Central Park! It sounds like Stanley Park has a lot of activities to do for kids. I bet there’s a lot to do for adults too haha. Yes, it’s like their version of Central Park! So much to do! Stanley park looks like a great place to spend time with family. I’m sure your children must have tremendously enjoyed the horse drawn carriage and the train. On another note, I often use hop on hop off buses whenever I visit a new city, since they provide a great way to explore places at your own pace. We love those hop on hop off buses! So great to get a sense of a city! I visited Vancouver last year and there are just so many things to do and see! Stanley Park is such a nice place; we rented bikes and rode around the park for an hour. If I had kids, I’m sure we would’ve gone to the aquarium or rode a horse carriage. Either way, Vancouver is a great place for all kinds of activities. Nice! We’re hoping to rent bikes there this summer with the kids! Canada is a beautiful country so many places to explore is just like this park. I have been to Toronto and every visit we always have a blast. Oh fun! I’m heading to Quebec for the first time with a quick stopover in Toronto! It’s so cool that you can drive to Canada -and Vancouver looks like the perfect family-friendly destination. The horse-drawn tour looks amazing. My kids would love it and so would I. We’d love to do the sea to sky gondola, the train and the hop-on hop-off bus too. It looks like the perfect itinerary for both kids and adults. Horse-drawn carriages and spray parks. Woohoo. LOL. It looks like you guys had an amazing day and what a beautiful aquarium. I really must get up to Vancouver. Am I the only one that forgot about Vancouver?! Great that you’re sharing this with people as a reminder. I know, right? It’s such a big city, but so underrated! Ah, I love giant parks with tons to do in them! The aquarium looks beautiful–reputable aquariums are so much fun to visit. I’d love to rent a bike and explore, too. Looks like you guys were there on a beautiful day! Yes, July is a gorgeous time to visit Vancouver, BC!